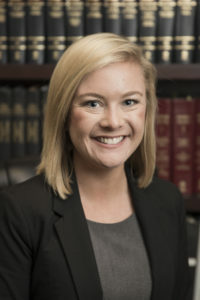 Brittney Crass joined Moore Ingram Johnson & Steele, LLP in 2017. Brittney is a member of the Civil Litigation department with a concentration in workers’ compensation insurance defense. Prior to joining MIJS, Brittney served as Judicial Law Clerk to the Honorable Thomas W. Brothers in Nashville, Tennessee. From Oliver Springs, Tennessee, Brittney attended Middle Tennessee State University where she obtained her Bachelor of Science in Political Science with a minor in English. After completing her undergraduate degree, she attended Belmont University College of Law where she served as Vice President of Arbitration for the Board of Advocates, allowing her to travel to Vienna, Austria to compete in the Willem C. Vis International Commercial Arbitration Moot Competition. She was admitted to the Tennessee bar in 2015. Brittney currently lives in Knoxville and enjoys Tennessee football and spending time with her family, friends, and dog named Romeo.